Tsuburaya Productions Co., Ltd. has provided SciFi Japan with information and large promotional pics for their new television series, ULTRAMAN NEW GENERATION CHRONICLE (ウルトラマン ニュージェネレーションクロニクル, Urutoraman Nyuu Jenereeshon Kuronikuru), which will air on Saturday mornings in Japan starting January 5, 2019. ULTRAMAN NEW GENERATION CHRONICLE will follow the style of the previous “Chronicle” series ULTRAMAN ZERO THE CHRONICLE (ウルトラマンゼロ ザ クロニクル, Urutoraman Zero Za Kuronikuru, 2017) and ULTRAMAN ORB THE CHRONICLE (ウルトラマンオーブ ザ クロニクル, Urutoraman Oobu Za Kuronikuru, 2018) by using footage from previous shows and movies, mixed with new content. The show will focus on the 2013-2018 “New Generation Ultra Heroes” Ultraman Ginga, Victory, X, Orb, Geed, Rosso and Blu. The 2018 feature film ULTRAMAN GEED THE MOVIE: CONNECT THE WISHES! (劇場版 ウルトラマンジード つなぐぜ! 願い! !, Gekijoo-ban Urutoraman Jiido Tsunagu ze! Negai!!) 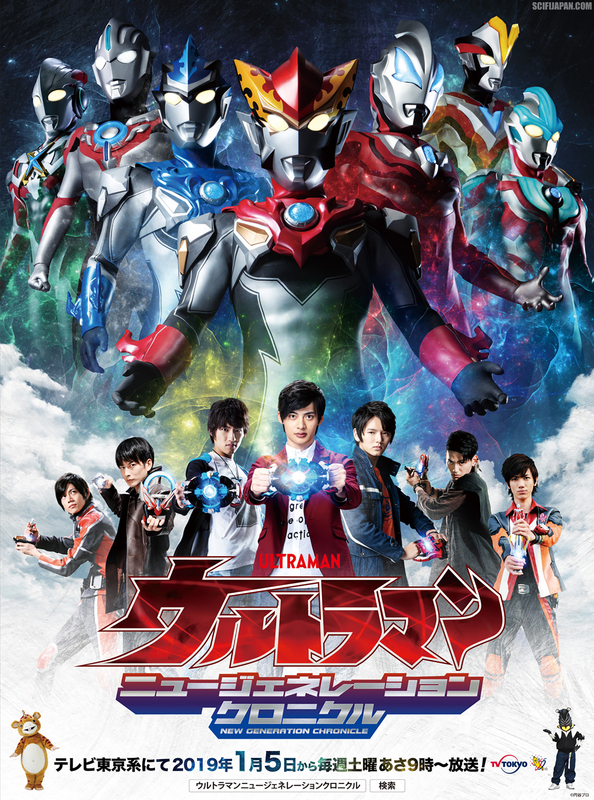 will be split into chapters for broadcast on ULTRAMAN NEW GENERATION CHRONICLE. The show will also celebrate the March 8, 2019 nationwide theatrical release of ULTRAMAN R/B THE MOVIE ～ SELECT! THE CRYSTAL OF BOND (劇場版ウルトラマンＲ／Ｂ　セレクト！絆のクリスタル, Gekijoo-ban Urutoraman R/B Serekuto! Kizuna no Kurisutaru) with a special summary of all 25 episodes of the ULTRAMAN R/B (RUEBE) [ウルトラマンＲ／Ｂ(ルーブ), Urutoraman R/B (Ruubu), 2018] television series. ULTRAMAN NEW GENERATION CHRONICLE will have a lighthearted tone thanks to the show’s co-hosts, the “Pleasant Beast” Booska and Alien Pegassa Pega. Booska is one of Tsuburaya’s oldest characters, starring in the 1966 series MONSTER BOOSKA (快獣ブースカ, Kaijuu Buusuka). Booska will be voiced by Miina Tominaga (ULTRAMAN LEO), who previously portrayed the creature on ULTRAMAN R/B. Pega was introduced in ULTRAMAN GEED (ウルトラマンジード, Urutoraman Jiido, 2017). Voice actress Megumi Han will once again play the alien on ULTRAMAN NEW GENERATION CHRONICLE. Han is fast becoming a fixture of the Ultraman Series; in 2019 she will also provide the voice of Ace in the Netflix animated series ULTRAMAN (ウルトラマン, Urutoraman). Booska and Pega will not only introduce each episode, but also interact in comedic bits that Tsuburaya Productions promises will be a major highlight of this show. ULTRAMAN NEW GENERATION CHRONICLE will also frequently feature special guests, including Tatsuomi Hamada as Riku Asakura/Ultraman Geed. 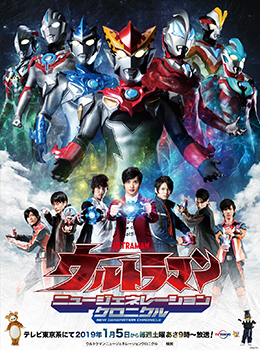 · Movie: ULTRAMAN GEED THE MOVIE: CONNECT THE WISHES!